Here ya go. You really want to kick off your mic collection with a bang, not with the cheapest thing you can find. Plus you need a pop filter, dust cover, shock mount, mic cable, AND a 10 year warranty right??? Rode has the solution. I completely back this product. 1) because if comes with everything and 2) because a Rode was my first actual studio mic and they are fantastic. You can get all of this for $400, making this a perfect mic to cross over into the big leagues. The NT2-A carries on the tradition forged by the legendary RØDE NT2. 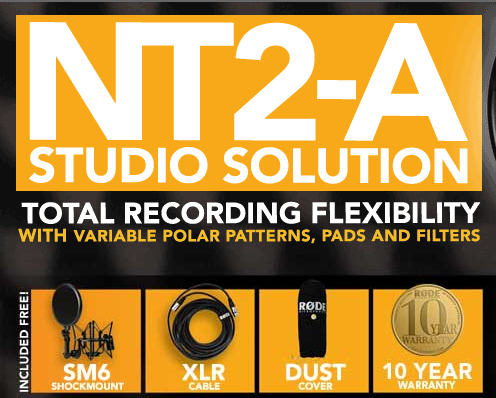 A professional large capsule (1″) studio microphone incorporating three-position pick-up patterns, PAD and high pass filter switches conveniently located on the mic body, the NT2-A is at home on an incredibly diverse range of sound sources. The frequency and transient response of this transducer has been voiced to complement today’s modern recording techniques, and yet still evoke the silky smooth character of the legendary microphones of the 50’s and 60’s. Its superlative audio characteristics combined with the included SM6 shock mount with integrated pop filter, 3m (10′) XLR cable and dustcover, make the NT2-A one of the most versatile condenser mics available. For the price, you can’t beat it. Just look at all of those features. Very seldom do I really push a product but I’m all about this mic.